Gonatus berryi is a relatively common and distinctive species. It reaches a maximum size of at least 240 mm ML. Figure. Ventral view of G. berryi, 119 mm GL. Drawing from Young (1972). club hooks proximal to the central hook that become larger toward the base of the club. virtually no suckers in the medial region of the tentacular stalk. Number of suckers in proximal half of each arm IV at 50 mm GL = about ? ?, and at 119 mm GL = about 45. Clubs unusually large, 30-37% of GL. Note large club size in title photographs. Club dactylus with 4 sucker series becoming disorganized at dactylus base where sucker series split into those leading to the marginal zones of club. Club ventral-marginal zone with 3 series of suckers in central region; medial suckers ca. one-fourth diameter of suckers of marginal series. Occasionally 1-2 small suckers present as a partial fourth series. Club dorsal-marginal zone with few suckers in 1-2 irregular series. Club medial zone with large central hook; small distal hook and proximal series with 1-2 suckers followed proximally by 2-4 small hooks with largest hook never closest to large central hook (i. e. hooks initially increase in size proximally). Total number of suckers (excluding terminal pad, medial zone) on tentacular club: about 159-181. Median region of tentacular stalk between marginal series without suckers except for occasional 1-2 sucker. Figure. Oral views of the tentacle and club of G. berryi 119 mm GL, plesiotype. Top - Left tentacle. Middle- Enlargement of the tentacular club. Drawings from Young (1972). Bottom - Right tentacular club. Photograph by R. Young. The drawings have been inverted for easier comparison with the photograph. Fins large, ca. 50% of PL. More details of the description of G. berryi can be found here. G. berryi, in addition to the features listed above, can generally be recognized by the large size of the central hook, the large club manus and narrow dactylus and the somewhat more distal position of the central hook. The advanced paralarva of G. berryi at 8-10 mm ML has a spherical digestive gland rather than the spindle-shaped, obliquely-oriented digestive gland common to paralarvae of many (all?) other members of the genus. Figure. Side view of a paralarva of G. berryi, 10 mm ML. Drawing from Young (1972). Figure. Chart of the size ranges over which hooks in juveniles of G. berryi first appear. Chart modified from Young (1972). Type locality: Monterey Bay, California, eastern North Pacific. G. berryi is broadly distributed across the North Pacific. Figure. Distribution of G. berryi. Dark pink area indicates known range; light pink area indicates inferred range. Chart modified from Okutani, et al. (1988). In situ photographs taken at depths of 736 m (left photograph) and 1080 m (right photograph. 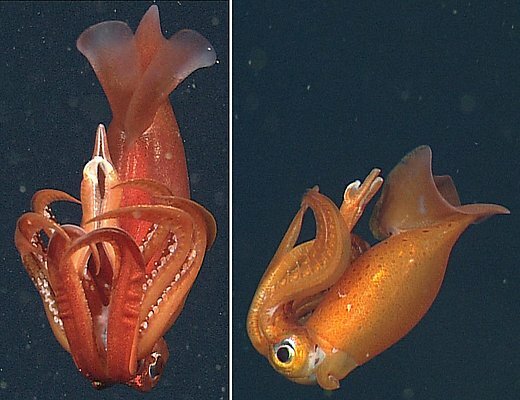 Note that in the left photograph the tentacles appear to be locked together at the club base and club tip. Two G. berryi showing the Dorsal Arm-curl posture. Nomenclature from Bush, 2009. Page: Tree of Life Gonatus berryi Naef 1923. Authored by Tsunemi Kubodera, F. G. Hochberg, and Richard E. Young. The TEXT of this page is licensed under the Creative Commons Attribution-NonCommercial License - Version 3.0. Note that images and other media featured on this page are each governed by their own license, and they may or may not be available for reuse. Click on an image or a media link to access the media data window, which provides the relevant licensing information. For the general terms and conditions of ToL material reuse and redistribution, please see the Tree of Life Copyright Policies.